One of the most famous Greek cities, Athens established a democratic government in 510 BC. In the 5th century BC, vast quantities of silver were found at the Laurion Mine, which contributed to the build up of the Athenian Navy in anticipation of war with Persia. 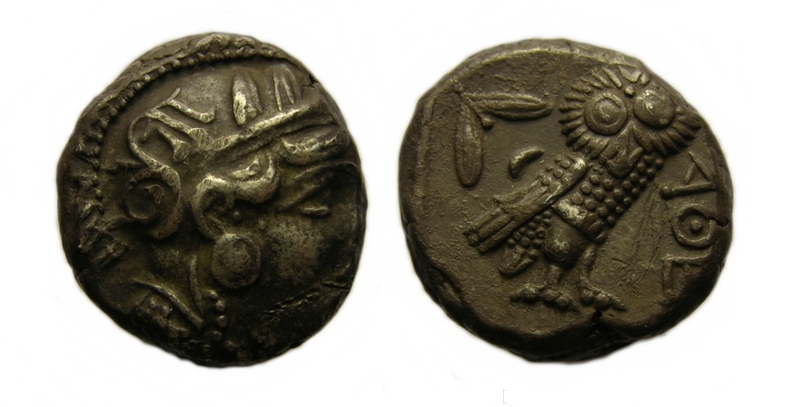 An amount of 5,000 silver coins was appropriated from the treasury of the Delian League in order to pay for the rebuilding of the cities temples, particularly the Parthenon, and to finance the Peloponnesian War. Obvs: Head of Athena right, wearing crested helmet ornamented with three olive leaves and floral scroll. Revs: AΘE in field to right, owl standing right. Olive twig and crescent to left, all within incuse square.